I told myself I wouldn't care, no I wouldn't care. But when she said she'd come round I combed my hair, yes I checked my hair. 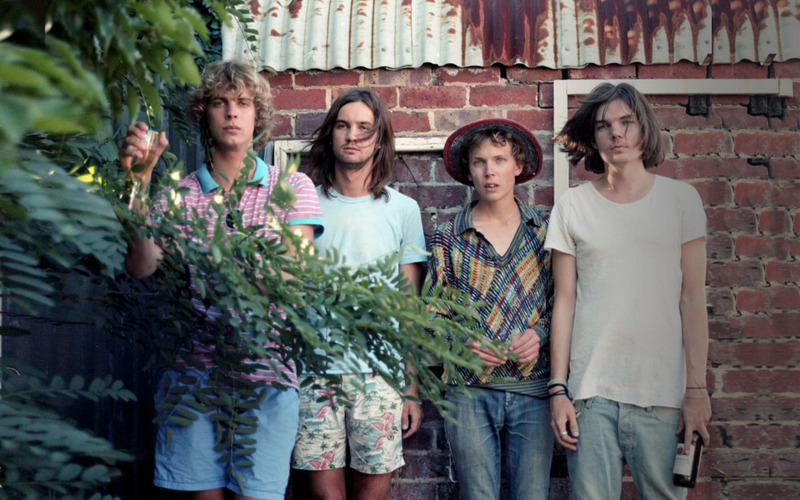 Hailing from Perth, Australia, Tame Impala play 1960-70s era psychedelic arena rock. This four piece group formed in 2007 out of the ashes of the Dee Dee Dums and consists of Kevin Parker (lead guitar, vocals, kazoo), Dominic Simper (guitar, synth), Jay “Gumby” Watson (drums, backing vocals) and latest edition Nick “Paisely Adams” Albrook (bass). Tame Impala's sound is reminiscent of San Francisco and London based flower power groups such as the Beatles, Jimi Hendrix, Syd Barrett era Pink Floyd and Cream (with bits of kraut rock sprinkled in between). The band's 2010 debut LP Innerspeaker exemplifies their penchant for classic rock by boasting vintage recording techniques, liberal use of reverb, open guitar melodies and soulfully warm bass tones. Since signing with Modular Recordings in 2008, Tame Impala has released an EP, full length LP and five singles. Their second full length is rumored to be in production for 2011. Perth, Australia’s Tame Impala couldn’t be more indebted to 1960s psychedelic rock giants like The Beatles and Jimi Hendrix, yet they’ve managed to craft a sound all their own. The band’s 2010 debut Innerspeaker is filled with dreamy, reverb drenched vocals and massive, fuzzed out guitar lines; all tied together with a tight pop sensibility. Sure it’s easy to associate their sound with your favorite vintage rockers if you think hard enough about it: Kevin Parker’s voice does sound a lot like John Lennon, and those guitar solos could be played by any number of San Francisco bands in 1968. Yet somehow, Innerspeaker still sounds like nothing but Tame Impala. Like many Australian rockers before them, Tame Impala makes music built for a stadium. Everything about them is big: the guitars, the drums, the reverb, but their choruses tower over it all. These guys write anthemic choruses that reach to the sky like a stoned U2. “Solitude is Bliss” is driven by a propulsive groove before giving way to nothing but Kevin Parker’s vocals, sounding like a 21st century version of Syd Barrett-era Pink Floyd. Then, with hardly a moment’s notice, they launch into a fists to the heavens chorus, backed by distorted hard rock guitars that lean closer to the Who or AC/DC than their psychedelic heroes from the 60s. “Why Won’t You Make Up Your Mind?” begins with trippy lead guitar before Parker’s plaintive vocals ask “Why won’t you make up your mind?/Give me a sign/You’ll be sorry when I make up mine instead.” The hook’s so great they repeat it throughout the song without a bit of trouble. Tame Impala flirt with the kind of classic rock influences that would cause a lesser band to stumble into the spot-the-influences-and-yawn abyss, but they end up all the better for it. Innerspeaker is the only album you can pick up by these guys at the moment, but rest assured there’ll be more greatness to come.